I couldn't be prouder of the ketubah I just completed for David Poster and Rebecca Cooper; it's the one I've been sharing details from here on the blog, and now I'm letting you see the whole thing (click on the pic to see it larger). The overall look of the ketubah is based on a deco aesthetic, to reflect the feel of the Palais Royale, where they will celebrate their wedding; this can be seen in the decorative borders, the patterned style of the imagery, and the English calligraphy style. The Torah portion from the week they were married is Parashat Bo, which describes the preparations our ancestors undertook in Egypt prior to the Exodus, which we now celebrate as Passover. 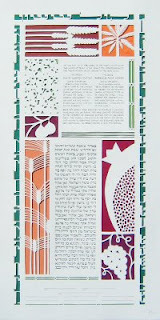 Specifically, the mezuzah is discussed, and that is represented as an abstracted door frame around the ketubah, built out of traditional wedding verses from the book of Jeremiah: “It is still heard in the land of Judea, and in the street of Jerusalem: the sound of celebration and joy, the voice of the bride and groom.” This shape also represents the hupah under which they were married. The main imagery is based on the seven species, described in the Torah, in the book of Deuteronomy: “A land of wheat, and barley, and vines; of fig trees and pomegranates; a land of olive oil and date honey.” This is a traditional Jewish motif, selected to illustrate David and Rebecca’s love of cooking together. The colors are warm and organic, reflecting the natural world.